Directions: From Bristol, VA: Take I-81 Northbound to Exit 35 in Chillhowie. Take Exit 35 and turn right onto Whitetop Road. Drive 11 miles until Laurel Valley Road. Turn left onto Laurel Valley Road. Drive 7.5 miles to Forest Road 613. Turn right onto Forest Road 613, and follow it 3.5 miles to a dead-end at the Scales parking lot. Before I get into the description of the trail, I would like to give a heads up. Forest Road 613, the 3.5 mile long road that leads to The Scales, is a very, very rough dirt road. High clearance vehicles are fine on it, but I do not recommend any low clearance vehicles. While I made it up and down in a mini-van (somehow), I don't think you should do the same. The road has lots of large rocks capable of damaging a low clearance vehicle. Otherwise, if you make it up to the trail, it is a very nice hike and well worth the efforts. The trailhead is called "The Scales". It used to be the site of a cattle-weighing station long ago. The trailhead has restrooms and a camping area. It also has a trailhead kiosk that contains a map and other useful information. The Scales is a major trailhead. the Appalachian Trail comes through it. It comes in from the left and goes to the right northbound. The Crest Trail goes through the fence to the right like the Appalachian Trail, but then turns to go straight up the mountain. The Crest Trail goes up to the Wilburn Ridge area. The Wilson Creek Trail goes straight from the traihead to Wilson Creek and the Wise Shelter. The Scales Trail bears slightly left from the trailhead, and also goes to Wilson Creek and the Wise Shelter. Lastly, the First Peak Trail goes sharply to the left from the trailhead, deep into the Little Wilson Creek Wilderness. If I ever move to this area (I really want to), I will hike ll of the trails in the Mount Rogers National Recreation Area, but for today's hike, I chose the most scenic option. I took the Appalachian Trail Northbound to the right. The AT goes through a fence. You will cross fences at least a dozen of times on the hike. They were built to keep wild horses in the designated area. Wait, what? Yes, wild horses are plentiful in the Grayson Highlands State park and portions of the Mount Rogers NRA. I actually saw some of them in the end. More on that later. There was a very narrow path between a set of fences, which was the Appalachian Trail. Immediately, there was a trail junction. The Crest Trail went to the left steeply up the mountain, while the AT beared right, following the flank of the mountain. The trail started off nice. It went into the forest pretty quickly. White blazes were plentiful. There were several small creek crossings, and I passed a campsite to the right of the trail. After that, a gradual but steady ascent started. The AT was climbing towards the summit of Pine Mountain. About 0.9 miles from the start, the AT crosses through the fence again. Most of the fence crossings have a small gate, so just move it aside and come through. It is not private property. After this, the AT reached a campsite. Right after the campsite, there was a big trail junction. The AT continued going forward, while directly to the left went the blue-blazed pine Mountain Trail. More sharply left, the Crest Trail came in and continued going up the mountain. The goal for this hike was to go onto the Pine Mountain Trail, and from here follow it to Rhododendron Gap on the other side of the AT. So far, I hiked 1 mile from the start, and there was 2 until Rhododendron Gap. The Pine Mountain Trail was climbing too. The path was typical dirt with a few rocks. It reached a summit around 0.7 miles from the junction, and then started going downhill temporarily. Here, the whole landscape opened up. The views were great in all directions, and the wooded peak of Mount Rogers was clearly visible. The next junction was with the Lewis Fork Trail. The Pine Mountain Trail kept going forward. If turning left, the Lewis Fork Trail would shortly end at the Crest Trail. If turning right, it would lead you deep into the Lewis Fork Wilderness and eventually to the bottom of the Mount Rogers Ridge, near Grindstone Campground. I continued forward on the Pine Mountain Trail, and an ascent began again. 1 mile was left until Rhododendron Gap. The trail entered the forest temporarily. It gradually kept climbing. It crossed some small streams along the way too.There were a couple rock outcroppings along the way, which provided great long range views. All the time, Mount Rogers crowned the background. Finally, just before Rhododendron Gap, there was a sign for the opposite direction stating "2 miles until AT". At the junction with the AT, I got a little lost. First, I went up a spur trail to a large rock outcrop, which provided some incredible views. After I returned from it, I somehow came out onto the Appalachian Trail. Fortunately, there was a sign soon that said I was going the opposite direction, towards Mount Rogers and Elk Garden. I turned back here, and at the rock outcrop, I saw something that somehow went unnoticed when I was there. Here, there was a sign for the Appalachian trail, and I saw where the Northbound AT went. From the Pine Mountain Trail, you have to take a sharp left to get onto it. As far as I hate to say it, the first 3 miles were the best part of the trail (at least in terms of tread). There were almost no rocks. From here on, there would be rocks everywhere. Almost right away, there was a junction with the Crest Trail. I wondered for a second. If going to the left, that would take me in 3 miles to the trailhead. If I went forward, I would have to hike more than twice that much. It was going to be dark in an hour. I had flashlights, so I decided to go. I didn't think I would hike in dark today at all, but the dirt road took all my time. Shortly after this junction, the Crest Trail took a right. It eventually leads to Grayson Highlands State Park. The AT climbed a large rock outcrop, where there were more great views. All day it was cloudy, but now the sun came out, and there was a spectacular sunset. I included the sunset in the picture gallery at the bottom of this post. After the AT came down this outcrop, I could see where it was going next. It followed a large field, where wild horses could be found often. In the distance, I could see the next rock outcrop. The trail didn't go over the outcrop though. It went to the left of it, and followed the path along the base of the outcrop. It was quickly getting dark, and the trail had tons of rocks. The blazes were not very often here too, so it was getting a little confusing. All the time, I was following Wilburn Ridge. The trail kept going down gradually. As soon as I entered the next grassy area, it was dusk, and the trail blazes were iffy. There was a confusing point soon, where there were two large wooden stakes with white blazes. Usually when there are two blazes, it means you have to turn, but not in this case. The junction was un-signed. I turned left, and found no blazes, so I came back. I took the trail to the right but didn't find any blazes either. However, a little farther on the right turn trail I came to a sign. Looks like I took the Rhododendron Gap Trail to the Wilburn Ridge Trail. 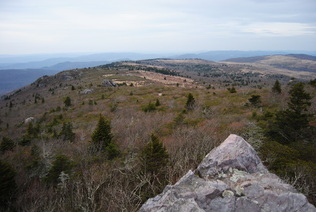 Wilburn Ridge Trail goes parallel to the AT, while Rhododendron Gap goes down to Grayson Highlands State Park. Thus, I went back to the double AT blazes, and decided to keep going forward the way I went. Turns out I was on the right path now. The blazes just confused me. I can't give such a thorough description of the part of the trail that was in the dark, but I will try my best. The trail commenced a gradual but steady descent. By now, I hiked roughly 4 miles since the start. The landscape seemed to be grass and shrubs, but the trail was full of rocks to prevent erosion. The rocks weren't helping me to speed up, though. According to the map, the Wilburn Ridge Trail came in from the right at some point, although I didn't notice it. Around 5 miles from the start, the trail became less rocky and entered the woods. There was a crossing of the Virginia Highlands Horse Trail. Keep going straight here. There were benches to be able to watch the wild horses. At 5.7 miles from the start, the AT reached Massie Gap. Here, the Virginia Highlands Connector Trail went steeply to the right to the Grayson Highlands State Park Trailhead. The Rhododendron Gap Trail went to the left. There was a large sign, indicating there was 5 miles left until the Scales. After this, a flat stretch of the trail followed. Not for long, though. The trail continued its descent soon, and here, I ran into some wild horses in the dark. They didn't go anywhere though, and I shot a picture of one of them. After this, a long and steady descent began. The trail finally entered the forest, and kept going down, down, down. What you go down, you must go up. The descent was longer than the ascent, but the rule still worked. With about 4 miles left until the end, the trail crossed Quebec Branch over a footbridge. Right after that, the trail passed through a horse fence again, and then down, down, down. Not as steep, but still down. Along the way, there was lots of runoff from the mountainside, so the trail constantly crossed small creeks. The rocky terrain was back too, so this certainly wasn't helpful in the dark. After a little while, the trail went back inside the fence. Unfortunately, the blazes weren't really often, so I had doubts sometimes if I was on the trail, especially in dark. Meanwhile, the down, down, down continued with no end in the stop! What the heck? Finally, about 3 miles from the end, the trail reached Wise Shelter and the end of the endless descent. The trail flattened out, as it went through the valley. Soon, there was a junction with the Wilson Creek Trail. Turning right here would lead to Grayson Highlands State Park, while turning left would lead to The Scales in 1 mile. The AT continued forward, with 2 miles left until The Scales. Immediately afterwards, there was a crossing on footbridge of one of the two branches of Wilson Creek. Luckily, there was a blaze afterwards, because the trail took a sharp right after the bridge. After this right, the trail crossed the fence again. However, it crossed using a set of steps this time. After that, there was a footbridge over the second branch of Wilson Creek, and the ascent to Stone Mountain began. There was a junction with the Scales Trail just under 2 miles from the end. Turning left would lead to The Scales in 1 1/4 miles. I kept going forward. The trail passed over a fence once again, and entered the Little Wilson Creek Wilderness. A steady ascent continued. I could tell that this area was wild, because the fores twas thick, and there was not a single sound anywhere. After over a mile of ascent, the trail exited the Little Frog Wilderness, and passed through another fence. This last section of the trail was endless. The top of Stone Mountain was completely grassy with very few trees, and in the dark, the trail just endlessly wandered through the tall grass. At least there were stakes with blazes. Finally, in about 0.5 miles (seemed like 5 miles), the trail started heading down the other side of Stone Mountain, and after passing through a fence one more time, it reached the Scales trailhead. In summary, this is a pretty hard hike, but it is very, very rewarding. I rate it a "Best Hike". It might even be the best trail I ever hiked. The gravel road is very, very rough. If you think you can get up there, try it. Don't go, if you have a low-clearance vehicle. You can easily get stuck. The trail itself has views almost all the time, so it will pay off.